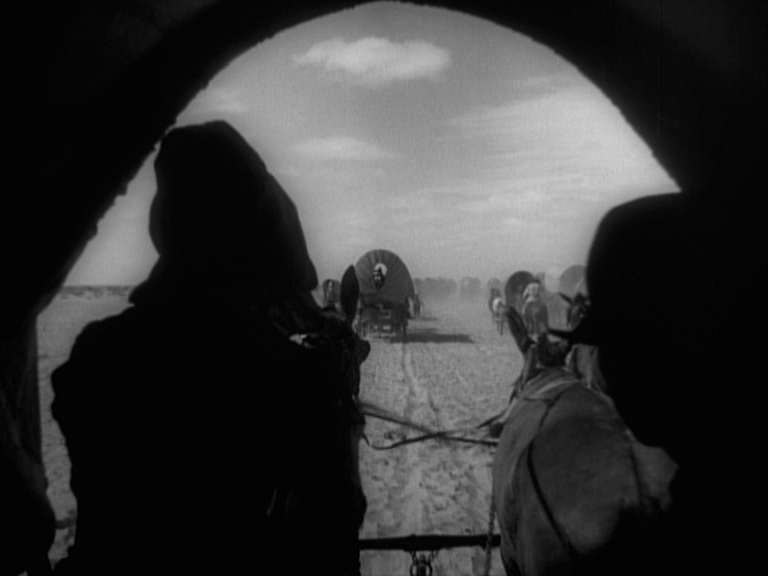 A frontiersman (John Wayne) seeking revenge on the man who killed his trapping partner agrees to lead a wagon trail headed west, not knowing the man he’s looking for is actually the sinister wagon boss (Tyrone Power, Sr.). Meanwhile, he falls in love with a beautiful widowed mother (Marguerite Churchill) who resists his advances, and is instead interested in a duplicitous gambler (Ian Keith). 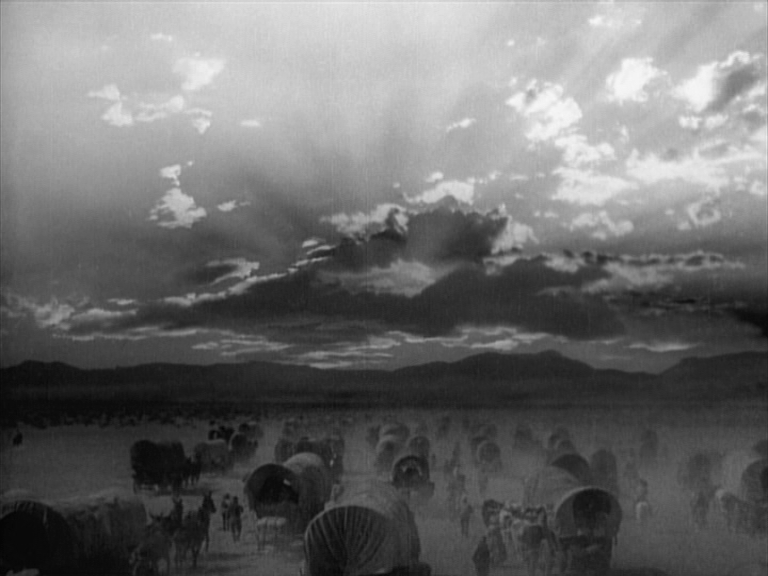 Raoul Walsh’s epic early western is notable for featuring Wayne in his first leading role, and for being shot in an experimental wide-screen process known as Grandeur 70. 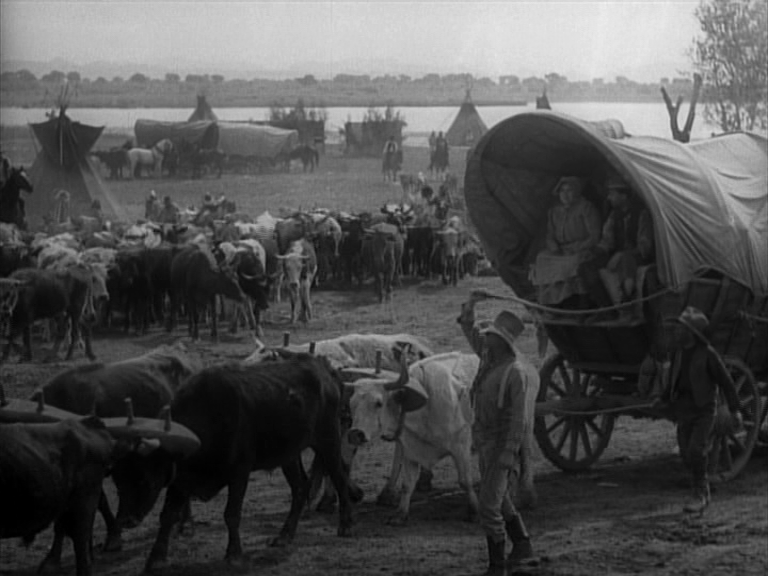 As an impressive recreation of the challenges of westward expansion, it visually rivals The Covered Wagon (1923); but its narrative is too cliched to maintain substantial interest. Power’s identity as The Baddie is not only revealed early on, but entirely foreseeable give his over-the-top performance; and Wayne’s romancing of Churchill (who’s offended by his accidental kiss of her early on, and can’t seem to let that go) is similarly predictable. 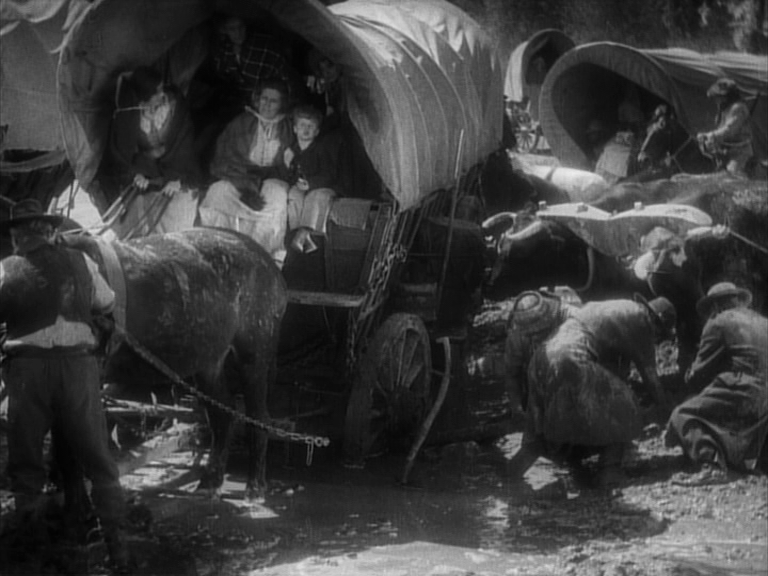 The best scenes are those showcasing the numerous perils faced by the intrepid settlers; the worst are those featuring “comic relief” El Brendel as a Swede terrorized by his menacing mother-in-law (Louise Carver). No, but it’s worth a one-time look. Listed as a film with Historical Importance in the back of Peary’s book. I first saw this film many years back at Waseda University (Tokyo), during a series of American films from the early sound period. I recall being impressed by director Walsh’s overall handling of the material, particularly his attention to detail. I thought the film was shot well and I was somewhat in awe of its production design and ambitious scope. Seeing the film again, my opinion remains pretty much the same. 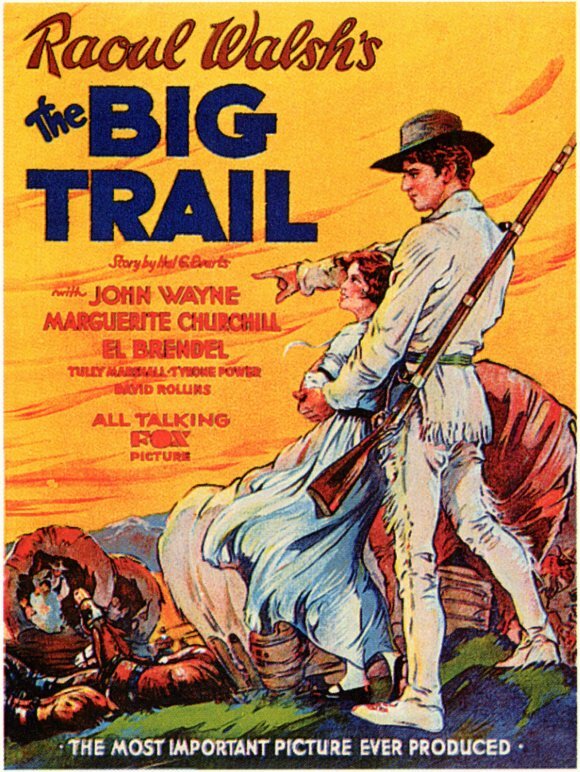 The film reads as believable in its depiction of early settlers. Though there’s no real story but the journey west, the episodic tale effectively interweaves the lives of its characters in a compelling manner. 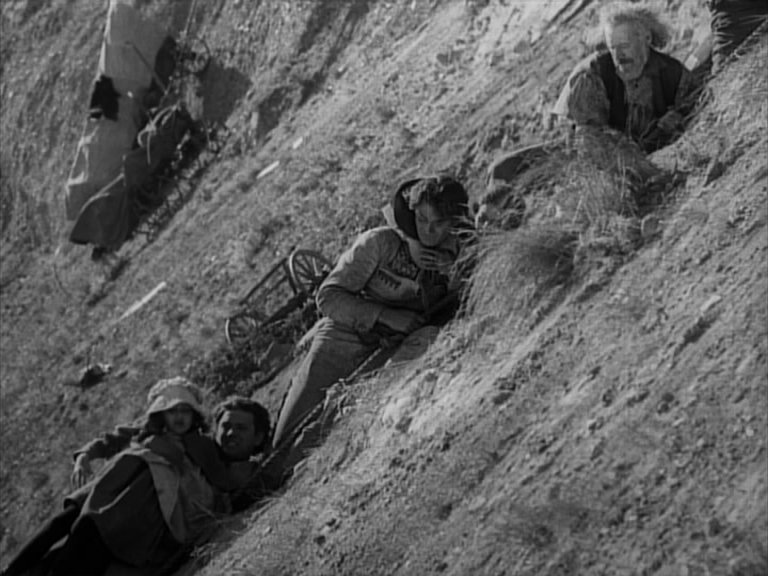 I especially like the sequence (midway) when the entire group of settlers must suddenly contend with a steep slope downward, and everything they have must carefully descend. It must have been difficult to capture that. Near the final point of the film, Wayne (who comes off a little ‘green’ in this performance) gives a gung-ho speech (in a snowstorm, no less!) to boost morale when the entire wagon party is just about spent. I can see where such a moment was thought necessary – but it’s still a bit much, and a bit jarring when the entire film up to that point has not given way to such ‘drama’. Overall, this wouldn’t particularly be a film I’d call anything like a favorite – but, for a piece of cinema on its way to being 100 years old, I think it holds up remarkably well and retains a decided power.